It seems like it’s been longer than a month since I did my Friday Faves, but it’s that time again! This month is definitely a mix, but that’s what keeps it interesting! The Piano Guys – Now that I’m finally able to turn off the heater in my office, I needed something to listen to that wouldn’t distract others at work. I turned on Pandora and found these guys. It’s the perfect music to listen to while concentrating on work. Plus the mash ups they do are fantastic! My favorites are The Cello Song and Beethoven’s 5 Secrets. Erica Sara Bracelet – Over the past year I’ve had my eye on a few pieces of jewelry, but could never decide which one I wanted. 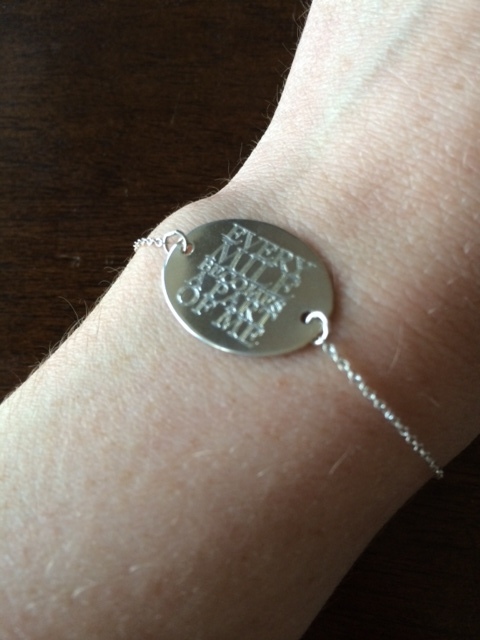 I finally decided on the Every Mile bracelet and I’m absolutely in love. The saying, ” Every mile becomes a part of me” has so much meaning to me. And the best part, it fits my tiny wrist! Now to figure out my next piece…. Oiselle’s Scantron Tank – I bought this tank as part of my race day outfit for Medina, but once I tried it out, I didn’t want to wait to race in it. It’s so light and freeing, it’s perfect for all weather. I love that its loose around the stomach so it doesn’t stick to you when the humidity is making everything else cling. I got the fresh green, but the brill blue is looking pretty good. 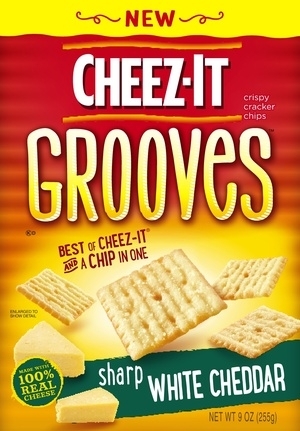 Cheez-It Grooves – I have an addiction, and I’m not about to fight it. I tried these crackers at a wine tasting a few months ago and I haven’t been able to put them down. As soon as I get home from work, the box is in my hands. I personally think they’re paired best with a port wine cheese dip. Yum…. GE Wine & Dine Events – We’re big fans of Buehler’s for our grocery shopping, but when a friend told us that Giant Eagle hosted a wine and dine night, we almost didn’t think twice. Once a month, they host a 6 course dinner that has a wine tasting for each part of the meal. For only $20 a person, or $35 for a couple, you get to try new foods and wines and meet some great people. This past event had a kale and yam salad, salmon, stuffed mushrooms, beef brisket, shrimp and Spanish chorizo, and turtle cheesecake. Nuun of the Month: Strawberry Lemonade. This flavor is perfect for the summer. It’s light and refreshing, combining a few of my favorite flavors into one. Now until Tuesday, May 27th, Nuun is offering free shipping. Make sure to jump on their website and stock up now! What are you currently raving about?